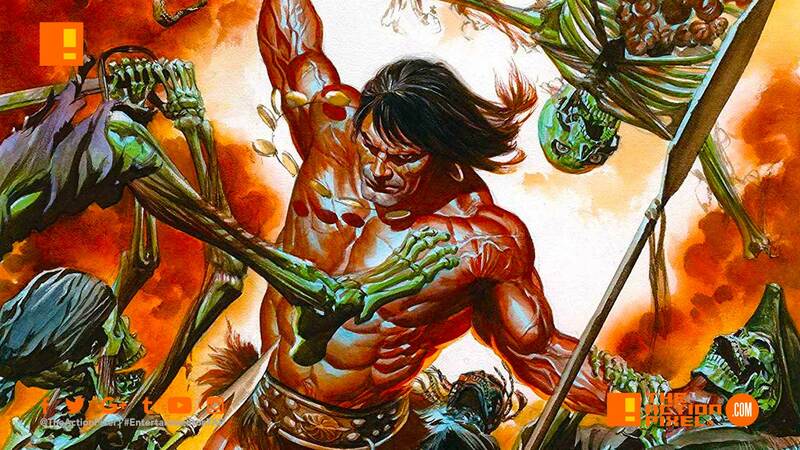 Conan was the glimmering light of the Bronze Age of comics under the Marvel banner. And since then has gone on to exist under other imprints including Dark Horse Comics. In Conan The Barbarian, tells the tale of the time when the Cimmerian, as a younger man, faced and defeated a magical creature calling herself the Crimson Witch. And though he nearly cleaved her head from her body, she returned many years later during his reign as king of Aquilonia. The yarn promises to feature the death of Conan, but we’ll have to return month after month to see how he fairs! Whilst Conan The Barbarian has already been released since January 2nd of this year (issue 2 comes January 16th [cover above]), next up is the Savage Sword of Conan which comes to comic book shelves February 13th. Elsewhere, the upcoming Savage Sword Of Conan drama will begin with our hero adrift at sea only to be saved by pirates intent on exploiting him. These brigands will find themselves on the wrong end of Conan’s rage, as will anyone who stands between him and the treasure he soon seeks, including the death cult of Koga Thun. © Marvel. Age Of Conan: Belit, Queen of the Black Coast. Plus, there is a Tini Howard and Kate Niemczyk helmed tale that is inspired by Robert E. Howard’s “Queen of the Black Coast” called Age Of Conan: Belit, Queen of the Black Coast. It is set to launch as a five-issue limited series in March. And with giving nods to the classic runs of the seventies, Conan sets to reinstate a new bronze age at Marvel.